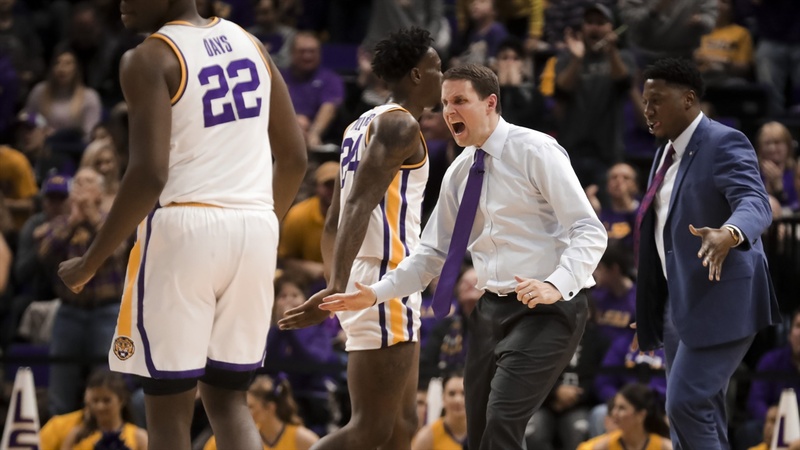 Kentucky was LSU’s opponent for Will Wade’s first game as coach in last season’s Southeastern Conference opener. When the No. 19 Tigers face the No. 5 Wildcats at Rupp Arena in Lexington on Tuesday (6 p.m. Central/ESPN), just four players who participated in that 74-71 Kentucky victory will be in uniform. Both teams have two returnees – starting power forward PJ Washington and backup center Nick Richards for the Wildcats and starting point guard Tremont Waters and starting shooting guard Skylar Mays for LSU. It should not be surprising that one of these players has been each team’s most productive performer in SEC play. Washington is averaging 16 points and seven rebounds while shooting 52 percent from the field. Waters is averaging 20 points and seven assists while shooting 48 percent from the field. For both teams, six of their top eight players are in their first season in the program – five freshmen and one graduate transfer for Kentucky and four freshmen, one four-year transfer and one junior college transfer for the Tigers. Wildcats coach John Calipari is accustomed to having mostly new players each season since he loses multiple individuals to the NBA draft. However, Wade is experiencing such a roster look for the first time in his young career. He really appreciates what Calipari must do each season. Wade starts just one freshman – power forward Naz Reid. However, the LSU bench consists of three freshmen – perimeter player Javonte Smart and post players Emmitt Williams and Darius Days. Then, two transfers are in the starting lineup – center Kavell Bigby-Williams and small forward Marlon Taylor. Three freshmen are in the Kentucky starting lineup – wings Keldon Johnson and Tyler Herro and point guard Ashton Hagans. All three of those players are averaging in double figures in SEC games – Herro at 14.1, Johnson at 10.8 and Hagans at 10.2 Hagans is also contributing nearly six assists per league game. The other Wildcats starter is Stanford graduate transfer Reid Travis, who is accounting for eight points and seven rebounds per SEC game. Richards is joined by two freshmen as Kentucky’s top reserves – post player EJ Montgomery and point guard Immanuel Quickley. Kentucky and LSU have both lost just one SEC game – the Wildcats by two points at Alabama and the Tigers by one point at home to Arkansas. The two teams are tied for second place – one game behind No. 1-ranked Tennessee, which puts a very experienced team on the floor. LSU picked up victories against two top-30 NET teams last week – Mississippi State on the road and Auburn at home. Wade stressed that the competition Tuesday night is even greater. Although Washington has been Kentucky’s most productive performer, Hagans has been the catalyst after he was inserted in the starting lineup eight games into the season. For the year, Hagans is averaging seven points and five assists per game. In their last two victories, the Tigers withstood a 17-0 run by Mississippi State and overcame a 16-point lead by Auburn. Wade acknowledged that LSU cannot put itself in the same situation at Kentucky. “This game is going to be different,” Wade said. “We can’t beat Kentucky if they go on a 17-0 run. We can’t get down by 16 points. We are not going to be down 16 or 18 points and chip it back against Kentucky. We have to keep the game in a working margin.